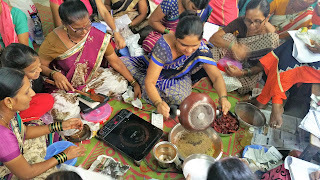 MUMBAI , 8-November-2017: The Don Bosco Development Society (DBDS), Mumbai organized a two days training workshop on ‘Indian Spices and Fancy candle Making Business’ on 6th and 7th November 2017 for the Self-Help Group (SHG) women from Dharavi slum in Mumbai . This training programme was held under the aegis of ‘Flood Relief Project’ supported by Don Bosco Mondo, Germany. Ms. Surekha Pednekar (Programme Coordinator - DBDS) welcomed the resource person. 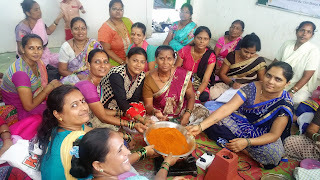 The objective of this training was to impart skill and knowledge on spice making & Fancy candle making as micro business for supplementary income of the families connected to this project. 40 SHG members completed the entire training. The training was held in association with ‘Dattopant Thengadi National Board for workers Education & Development’. Mrs. Mahimai and Mrs. Ujjwala Dorugade were the resource persons. During the training 12 different kinds of spices and Fancy Candle making were taught to participants. This included Chole Masala, Biryani Masala, Dabheli Masala, Malvani Masala, Pav Bhaji Masala, Kolhapuri Masala, Tanduri Masala,Chicken Masala etc. Participants of the training were selected based on an interview. Mr. Pradeep Moon (Director of Dattopant Thengadi National Board for workers Education & Development) & Mr. M.V. Desai was the resource person for training on marketing, costing, budgeting, pricing and branding of product. The participants dedicatedly learnt the skills and were determined to start-up a small business. Spices and Fancy Candle’s Raw material was also distributed to participants to help them in starting their business. “I was affected by the recent flood and heavy rains thereafter. I learnt new income generation skills here. I am grateful to Don Bosco and hopefully with this skill of Spices & Fancy Candle Making I will be able to generate some income for my family,” said Mrs. Sanjeevani Kharatmol. Mrs. Kavita Kamble (DBDS – Staff) along with the DBDS team organized this event; she also proposed the vote of thanks at the end.